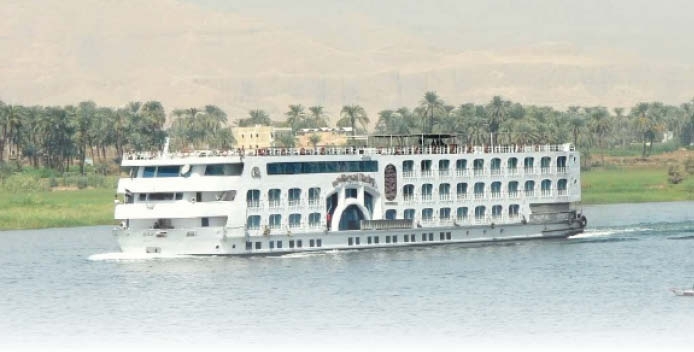 As part of the state’s continuous efforts to attract additional tourists and revive the country’s ailing tourism industry, Egypt’s Ministry of Tourism reached an agreement with Greece last week to launch cruise lines between the two countries, international relations advisor to the Tourism Minister Samy Mahmoud said. The trips will begin with medium-sized cruise ships carrying 700 to 800 passengers between Greece and Egypt, via Port Said and Alexandria. Further on, the ministry plans to begin using larger ships with a passenger capacity of 2,000 to 5,000 passengers by 2019, Mahmoud said. The effort marks the latest attempt by Egyptian authorities to kickstart a sector that has traditionally been a primary source of foreign currency, but which has struggled since the 2011 uprising that ousted president Hosni Mubarak. Currently, the top markets for Egypt are Europe, which constitutes 70 percent of tourism traffic, followed by the Arab nations constituting 26 percent, official statistics show. “We are promoting Egypt to all age groups with different packages to suit everyone. We have special products like the Nile cruise, history and culture for the elderly travelers; and many adventure activities for the youth. We also have programs that will suit families,” Mahmoud said in a phone interview on Thursday. As Egypt’s tourism industry was struggled to remain alive in the aftermath of the 2011 events, conditions took a turn for the worse after the suspected bombing of a Russian airplane in October 2015. The plane was carrying 224 people, all of whom died, and was en route to Russia from a Red Sea resort when the incident occurred. In April, Minister of Tourism Yehia Rashed said he’s stepping up tourism activities by lunching promotional campaigns and expanding into new markets for Ramadan, Eid and the summer vacations, with the goal of reviving visitor number. The tourism campaigns are scheduled to begin during the holy month of Ramadan, targeting Arab tourists from Saudi Arabia, the United Arab Emirates, Kuwait, Bahrain, Lebanon and Jordan. Rashed said the Arab market represents one of the most significant markets exporting tourism to Egypt; because of the geographical proximity and the similarity of their language and traditions, Arabs feel like they’re in their second home when they’re in Egypt, he pointed out. In addition to more diverse tourism offerings, Egypt has also been planning to promote religious, medical and luxury trips, and develop new markets in India and Eastern Europe, as it pushes to resuscitate the tourism sector to pre-2011 levels within two years. “We have one direct flight which flies four times weekly from Mumbai. We also have several connecting flights from India as well. We are hoping for more direct flights from India connecting with 1 or 2 cities by December this year,” Egyptian Tourism Counselor – Regional Director India and Far East, Ismail Hamid Amer told the Hindustan Times, adding that Egypt is being promoted as a premium and exotic destination in India and is expected to reach the potential of 300,000 tourists by 2019. “It is likely for India to be among the top 10 source markets for Egypt in 2-3 years,” he said. Egypt has already seen a feeble reversal of the plunging trend it has endured for years, from tourism levels still as low as 5.4 million in 2016, according to government figures. But to bolster these improvements and step up an unrelenting recovery, officials plan further promotional programs far removed from the traditional offerings along the Red Sea resorts, or the antiquities for which Egypt is well-known off. “The final target is to get to the 2010 numbers,” Rashed recently told Bloomberg, referring to the more than 14 million visitors the country hosted in 2010, its peak year for tourism arrivals. Germany is the top growing market, followed by the Middle East, especially Saudi Arabia. There’s also been growth in tourists from China, Japan, the US and Ukraine.